The Long Beach Unified School District added two more schools to its growing list of California Green Ribbon Schools this month. Rogers Middle School’s Green Team earned a gold level award while Franklin Middle School and its Eco Club earned a silver level honor. State Superintendent of Public Instruction Tom Torlakson announced the winning schools and districts. The awards honor schools that conserve resources while promoting health and environmental literacy. Torlakson said the recognition is especially important now that the environment is facing so many threats such as climate change. “These schools follow and advance a proud California tradition of caring for the environment and preserving our state’s stunning, natural resources that are celebrated and known throughout the world,” Torlakson said. Green Ribbon Schools specifically demonstrate exemplary achievement in three areas: (1) reducing environmental impact and costs; (2) improving the health and wellness of schools, students and staff; and (3) providing effective environmental education that teaches many disciplines and is especially good at incorporating science, technology, engineering and math (STEM) education, civic skills and green career pathways. Rogers teacher Pamela Weinstein and the school’s Green Team, along with Franklin teacher Ruth Lisha and the school’s Eco Club were recognized by Torlakson at a recent ceremony. Honored along with those teachers was Franklin’s library teacher Nina Jackson, who helped to write her school’s application, and LBUSD’s energy manager, Petter Hennum. 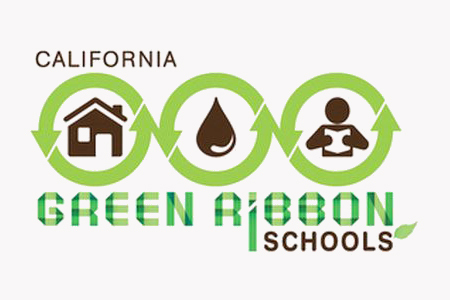 LBUSD now has seven schools that have earned Green Ribbon honors, including the two newest winners. Prior winners include Los Cerritos, Hughes, Longfellow, Lowell and Twain schools.